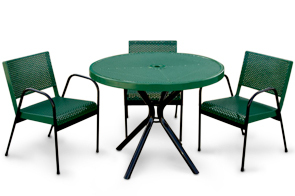 Perfect for your patio, café or any canteen style environment, this thermoplastic coated combination of punched steel stacking chairs and round café table will be a long lasting investment. By combining high strength steel fabrication with the latest thermoplastic coating technologies, we have the competitive edge in corrosive and maintenance free, outdoor patio furniture. The 42" table is constructed from # 11 ga. punched steel and has 2" O.D. Legs for added strength. The seats are also # 11 ga. punched metal with a 3/4" Arms. 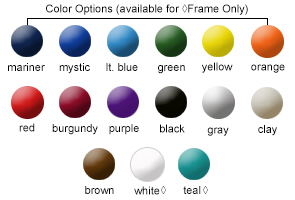 Both the café table and stacking chairs are available in any of the color options shown below. The café table is finished in a lightly textured Polyethylene coating. Table measures 31" in height and comes standard with a 2" umbrella hole. Stacking chairs measure 21"W x 33"H x 26"D with an 18" seat height.